Should We Not Have Two Witnesses? My first thought was, candidate for what? There are sooo many answers to that question. It most likely isn’t personal in nature as a nanny or member of the housekeeping staff would be. 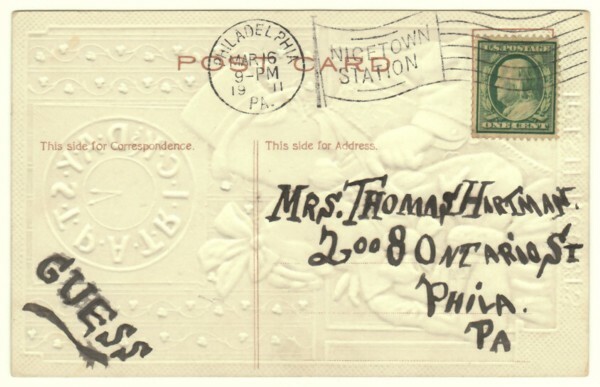 The sender, C. Turner, and the recipient, Mrs. R. Legge, lived in two separate homes. It is most likely some sort of public position; especially since C. Turner said he or she would be in attendance. I wonder why witnesses would be needed? And why 2? 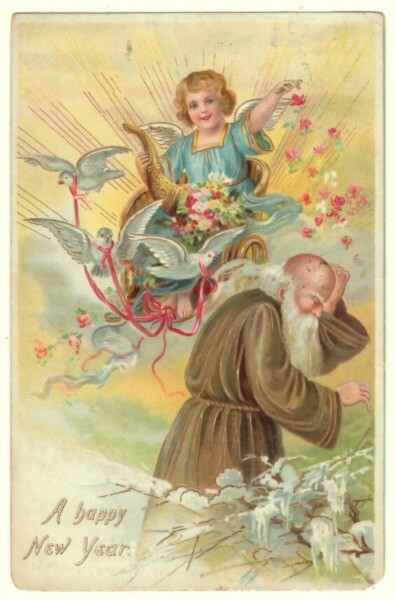 Many more beautiful angel and new year postcards are available for sale in my store, Remember When Vintage Postcards. ** If you liked this post and want to share it, click on the bookmark link to the right. Today I will continue my series on ingenious novelty trade cards. You will read how die-cut trade cards went above and beyond other trade cards in their efforts to grab the customer’s attention with approaches not seen on other victorian trade cards. Below is the third of 3 posts highlighting the various types of novelty trade cards. See part 1 for my post on hold-to-light trade cards and part 2 for my post on metamorphic trade cards. 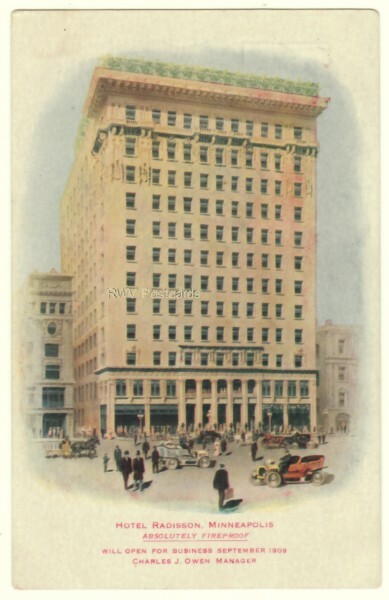 This type novelty trade card used its non-rectangular shape to attract the attention of customers. 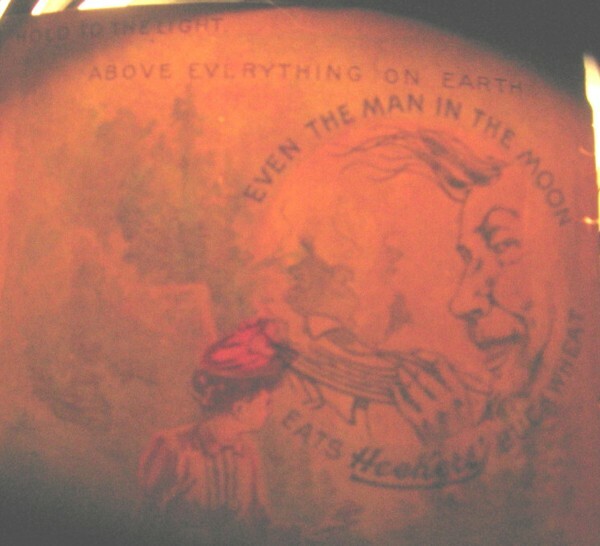 The card was cut during production into various shapes; most often animals, palettes, and fans. Die-cut trade cards cut into shapes resembling the product or it’s name, gained a further advantage in that the customer’s attention was more likely to be caught, and held longer, due to the irregular shape. This die-cut trade card was cut in the shape of the product’s name- an acorn for A-Corn Salve. 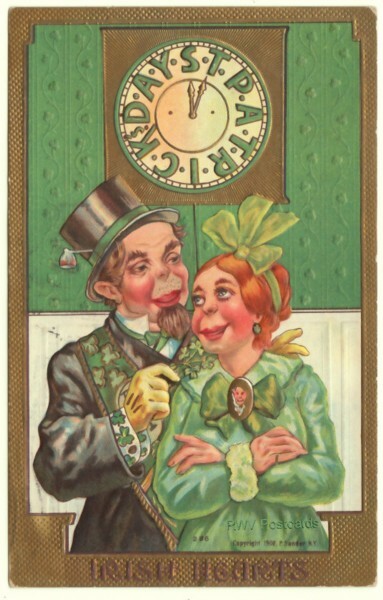 This die-cut trade card was also cut into the shape of the product, Holland Creamery Butter, but added the irregular shape of a Dutch couple kissing. Who wouldn’t want to try kissing?? For further information on Holland Creamery Butter, see Holland Butter Trade Card – 1912 Flashback. This die-cut trade card used the irregular shape of a baby; an always popular image. This particular trade card was a stand-up card, allowing further interaction by the customer. For additional information on the Hecker Company, see Opposition to 1900 Flour Trust Reorganization. One thing a collector should be careful of when purchasing a die-cut trade card- closely inspect the back to make sure it wasn’t cut from a regular trade card for scrapbook purposes. 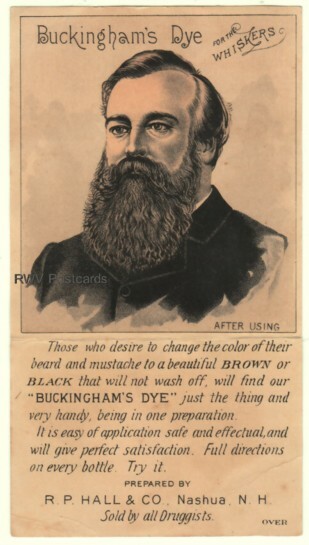 One type of victorian trade card is the novelty trade card. The advertisers on this type trade card were ingenious in their efforts to grab the customer’s attention. By going beyond the normal rectangular trade card, they created a way for the customer to interact with the trade card. This was an approach not tried on rectangular trade cards. Below you will find the second of 3 posts highlighting the various types of novelty trade cards. See part 1 for my post on hold-to-light trade cards. 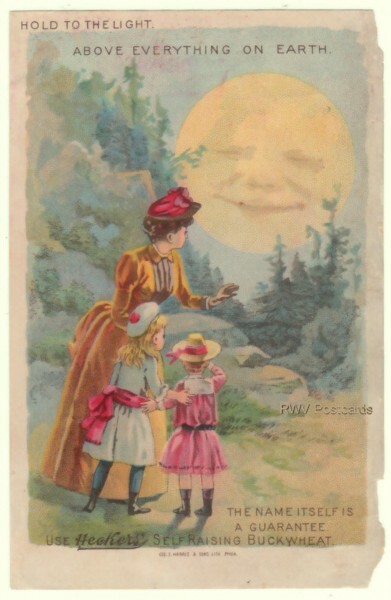 This type novelty trade card had one or more flaps that changed the image when opened. Most often, the expression or clothing changed. Trade cards with top or side flaps are uncommon. Multiple flap trade cards are scarce. Many novelty trade cards used a “before and after” affect. Some collectors believe only novelty trade cards showing the result of using the advertised product should be classified as having used this affect. I believe that if a change results from manipulating the flap, it should be classified as having used the before and after affect. It should not matter if the results of using an advertised product were shown or not. 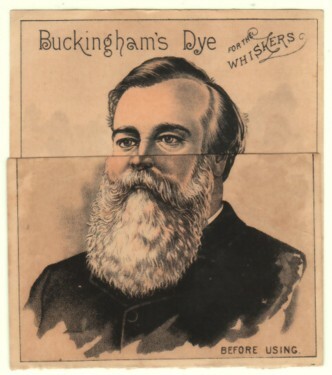 The below metamorphic trade card is one that does show the results of using the advertised product, Buckingham’s Dye for Whiskers. ** Be sure to return for the third post in this series; die-cut trade cards. There are so many different types of colorful Victorian trade cards with great graphics to collect. One such type is the novelty trade card. The advertisers on this type trade card went above and beyond other trade cards in their efforts to grab the customer’s attention. They created a way for the customer to interact with the trade card; an approach not tried on other trade cards. Below you will find the first of 3 posts highlighting the various types of novelty trade cards. This scarce type of novelty trade card was designed to join the back’s image with the front when held to the light. 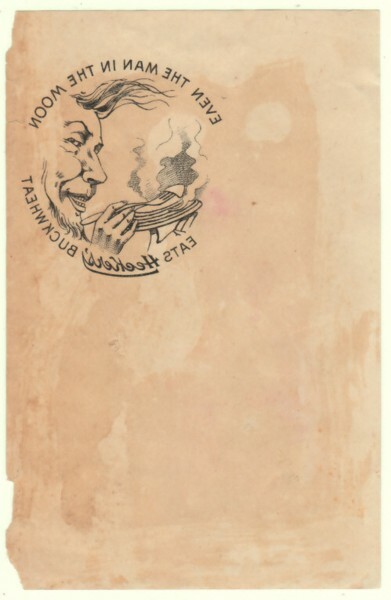 The advertisers knew the image on the backs of hold-to-light trade cards had to be in reverse so they didn’t appear backwards when looked at from the front. A backwards image would not have helped a product catch a customer’s eye. Hold-to-light trade cards were also printed on thin paper so the back images could show thru. Unfortunately, this often times resulted in damage similar to the card you see below. I guess there had to be a trade off to accomplish an advertiser of this type novelty trade card’s goal – to grab and keep a customer’s attention. Be sure to return for the second post in this series; metamorphic trade cards. The 2nd week in August, I posted pictures of funny victorian trade cards. One of them involved a black boy stealing a skinny dipping white boy’s clothes. The subsequent searches for stealing black boy and similar terms increased, so thought I would feature it today. On the surface, it is funny. Look deeper. The stereotype of the black person as simple-minded children, incapable of caring for themselves, was alive and flourishing at the time this trade card was published (late 19th century). Yet , this victorian trade card publisher depicted the black boy as cunning and smart enough to know when to steal the clothes (when the white boy was at a disadvantage). It is good that not all people believed in the black stereotype in victorian times. ** You can find more victorian trade cards with great graphics and color in my store, Remember When Vintage Postcards. ** If you liked this post and want to share it, click on the bookmark button to the right.